Continuing on from my trip report for Day 7 – I Can Show You The World here is our journey around France! The first thing we did was go and watch Impressions de France. You are seated in a theatre with a huge screen that shows a film about France. 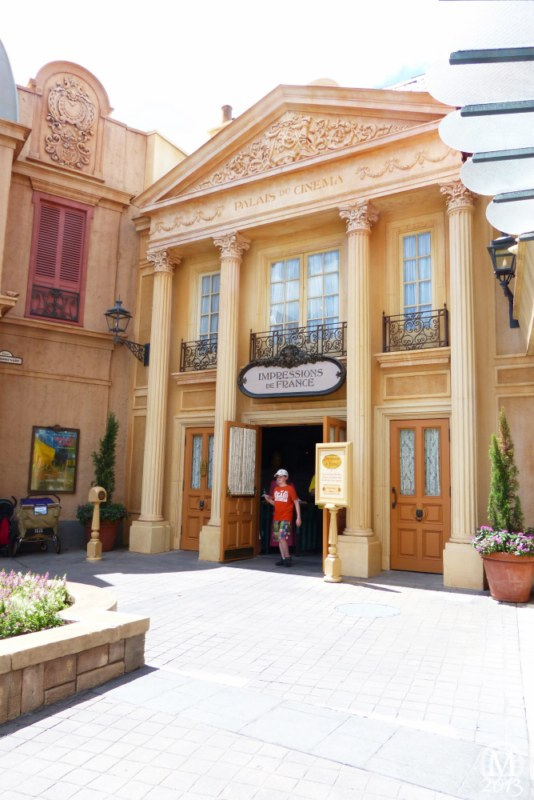 Despite it being very dated (all of the country films in Epcot are!) it was still very impressive to watch. It’s hard to describe, but the way it is filmed makes you feel like you are moving, and it did make me feel a bit queasy! This restaurant pictured below is Chefs de France. It has got a very tiny character interaction with Remy from Ratatouille…which I hear is now stopping at the restaurant – what a shame! I would have loved to eat there and see him come out on the cheese tray! We saw that Princess Aurora was going to be doing her meet and greet, but there was already a bit of a line, and we really didn’t want to wait in it, so we bypassed meeting her. We’ve met her before, so it wasn’t too big of a deal. I know that Epcot isn’t a popular park with a lot of Dibbers (from what I read on here anyway!) but we really enjoy this park. I aim to spend a lot more time exploring the different places in each pavilion when we come back again! On this trip we took our time, but still feel like we missed lots! Or rather, there are lots of places to eat and drink, and you can’t possibly do them all! Our aim is to be able to say we’ve eaten and drunk all around World Showcase! We popped into a gift shop for a nosey, and bumped into our friends. Their kids were doing the Kidcot Fun Stop activity, which Liam is a little bit too old for now…we all commented how quiet Epcot was and then parted ways again! We bought a magnet – our must buy souvenir from whenever we visit somewhere! We wanted to buy one from each country, but not all of the shops seemed to sell country specific ones which was a shame. We found a penny press machine, and put our penny and quarters in. Our aim was to get one at each of the pavilions, but we couldn’t locate one in all of them – need to look harder next time! Liam, even at 14, was quite happy to meet and greet characters. Belle had a good old chat with him before signing our autography book and posing for a photograph or two.